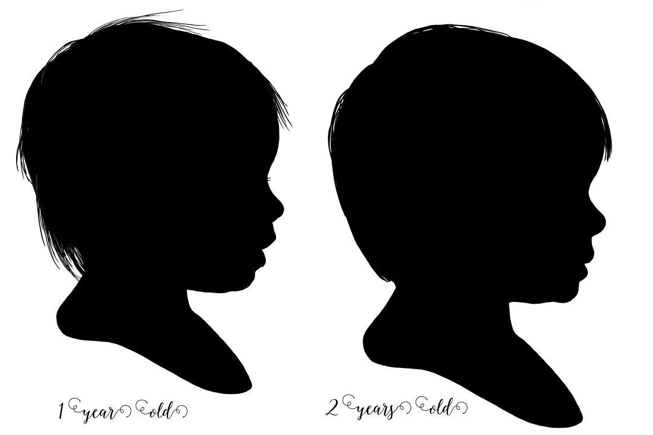 I'm always excited to have return business, but my favorite is making an updated silhouette of someone's little one. We all know how fast children change (almost overnight, it seems). I feel that investing in annual silhouettes is important like investing in professional photography is important. And now I know it's true of my little guy (three in May). I lined up the silhouettes I've made of him and just look at the differences! So fast! So different! The profile view of a child is so distinct. 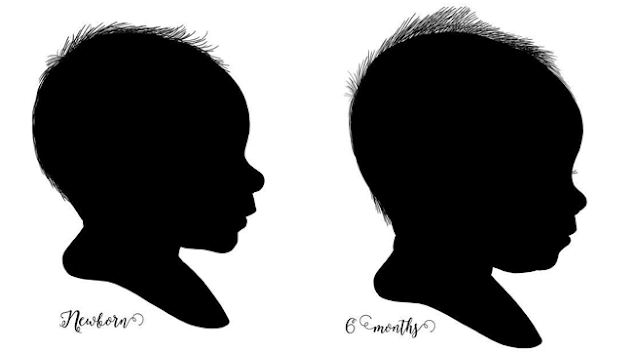 I've committed to keeping the cost for silhouettes cheap in order to help parents document this ultra-specific look that says so much about their little ones. 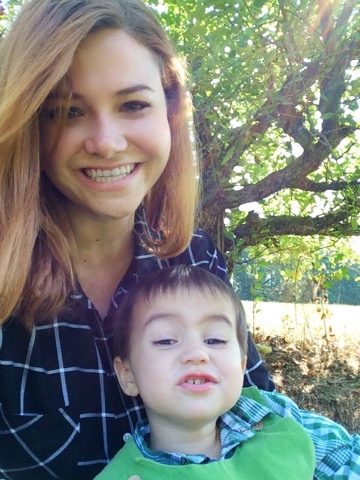 You can create this customized Fall look pretty easily! 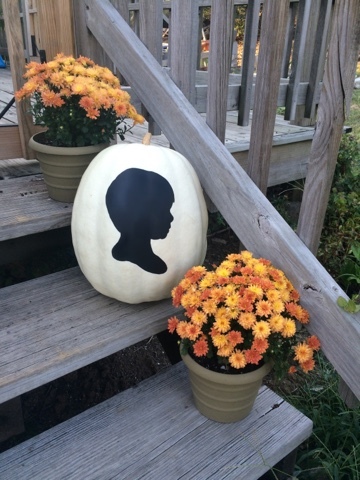 All you need is a big, not too bumpy pumpkin (tall seems to be better, too), a printed silhouette, scissors, a pen, paint and paint brush. 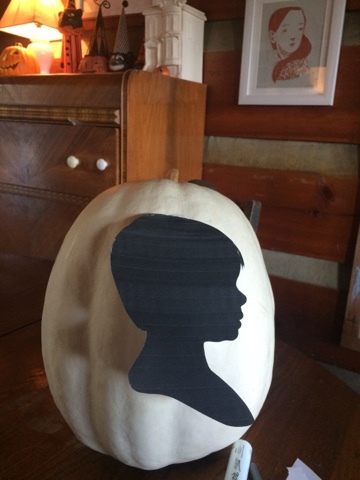 First print your silhouette and cut it out. Next tape it in position on your pumpkin. Next draw around the outer edge with a pen. Finally paint in the outline. I used acrylics, which are pretty thin and dry quickly, so I needed two coats. 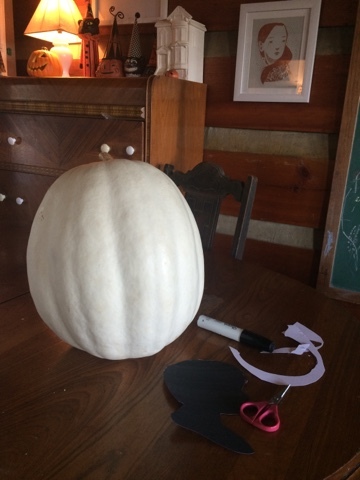 If your pumpkin will be exposed to the elements, you may consider sealing it with something. 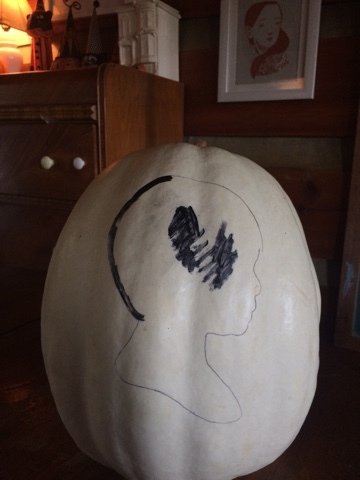 The final step is to proudly display you pumpkin and sense of sophisticated Fall decor. 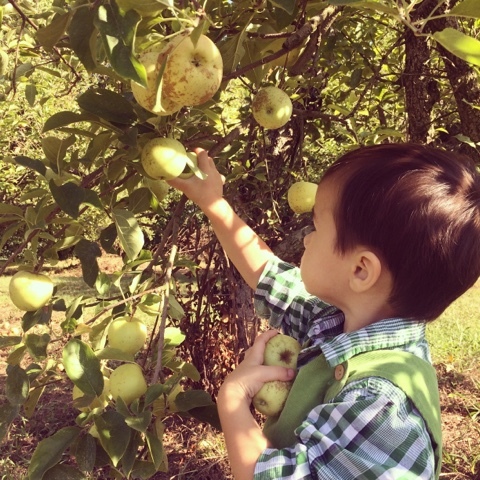 Spent the early morning picking apples with my buddy to make some paleo Apple crisp-esque thingy. I also spent some of the day working on hand cut silhouette orders and making a portfolio book of examples to have out on my table at events. I'm so excited about upcoming events! I can't wait to make real-life friends with you all! Keep reading over the next week or so...I'm planning a hand painted silhouette giveaway. EXCITING THINGS . . .
Hello all! I just wanted to say thanks for taking part in the birthday festivities over on instagram. 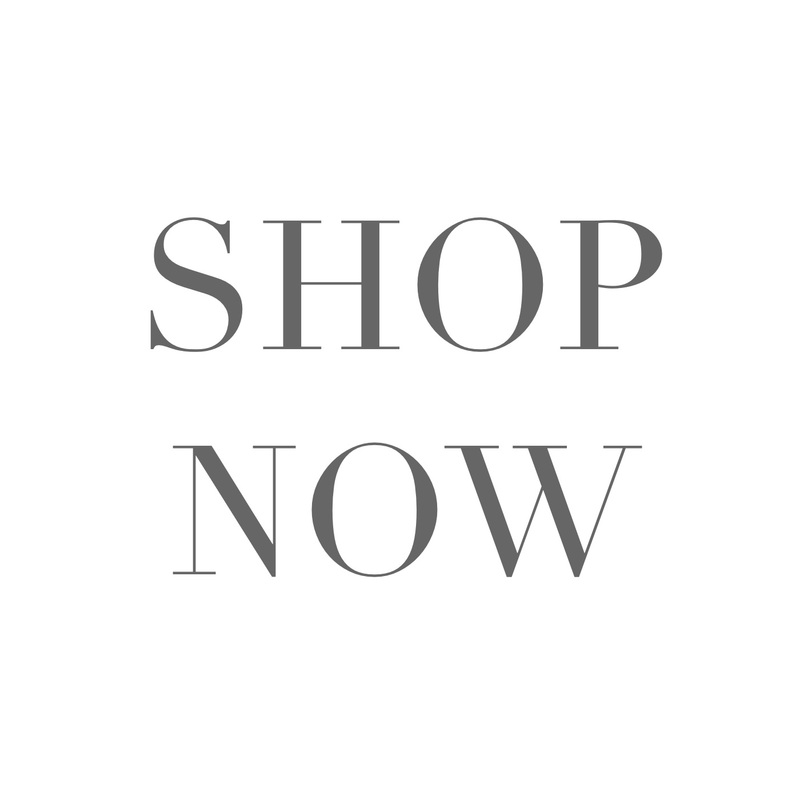 I was really delighted by the turn out, and I always love having sales. I'm excited to say that I'm finishing up the tiny details for HOLIDAY goods and deals, and finishing up the details for offering hand painted silhouettes. I'm so excited about both! 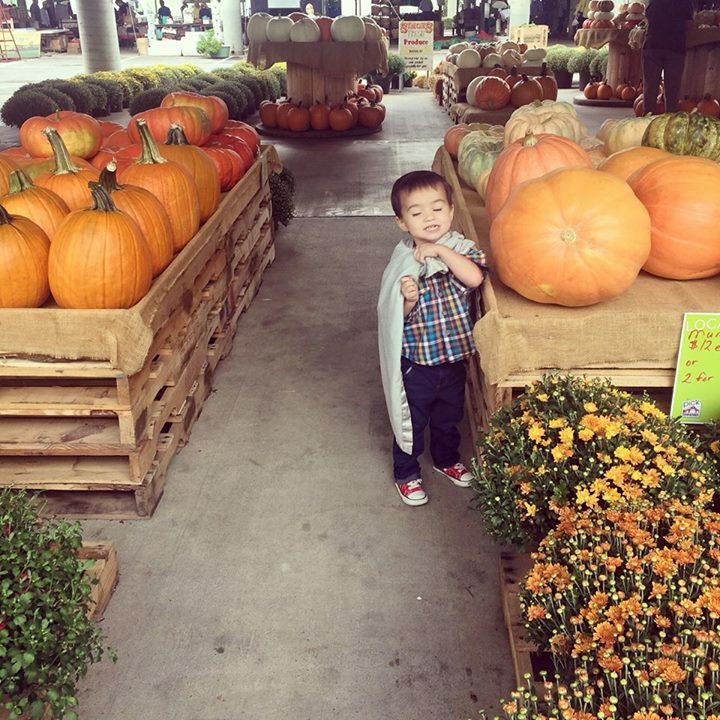 We are trying to contain our delight for Fall around our house. Julian, who is two and a quarter, is always reminding us that it's "hawooween" time. Slow down, buddy. It isn't even October! Meanwhile, I'm working on Christmas stuff for the shop already. We have Holiday confusion around here. Tennessee is always so lovely this time of year. So dripping with the last sweet and heavy bits of Summer, and so crisp in the morning and at night. It is such a beautiful place to live. If you enjoy our gorgeous state as your home too, make sure to go by the Nashville Farmer's Market. We've been every Saturday for the past few weeks and LOVE going. 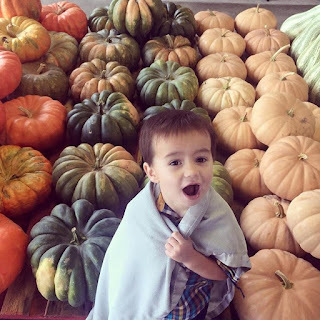 Julian even tried popcorn for the first time and licked a bell pepper that wasn't ours, ha ha. © Meiska Starner. Simple theme. Powered by Blogger.